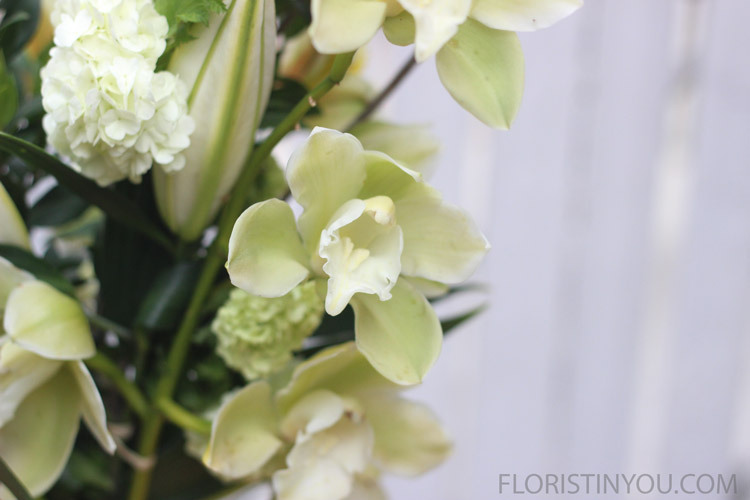 This tall arrangement is made from exotics, and some of them you can grow in your own backyard. 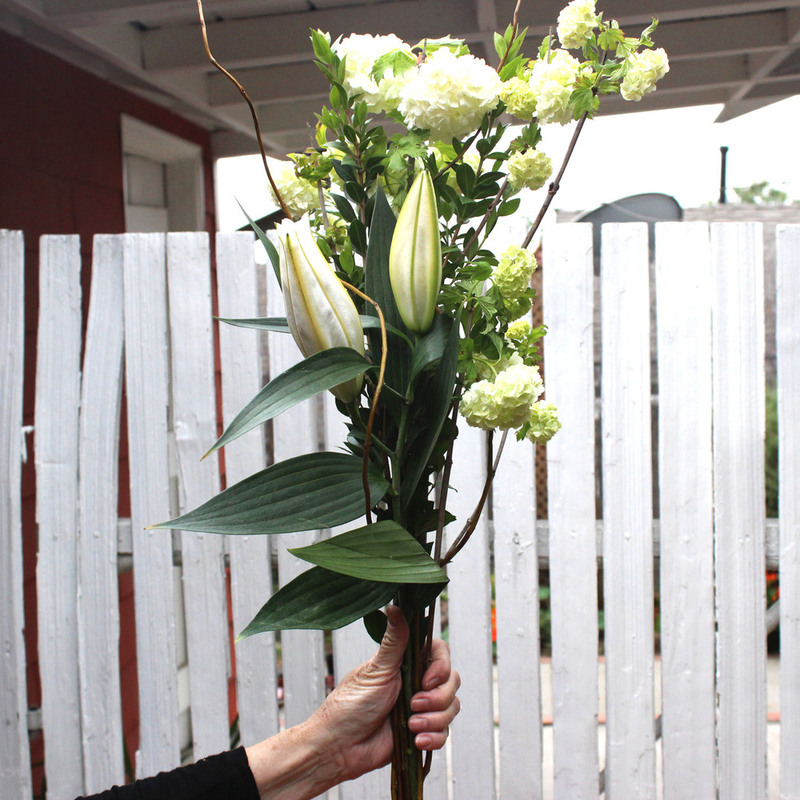 It is the perfect height and shape for a centerpiece. The curly willow in the top, gives it a formal finish. The cymbidiums in this series of 5 centerpieces, all came from friends' gardens, each with their own unique coloring. I have also found them at my local farmers' market for $4 a stem. That's a real bargain. The viburnum, or 'little snowball plants' that look like mini hydrangeas on a stem, evoke thoughts of spring and serve to fill out this very linear arrangement. The lilies, although not yet opened in this arrangement are very fragrant. You don't want to select lilies that are already wide open, because the flowers will bruise as they are being arranged. Select lilies that are just beginning to open. 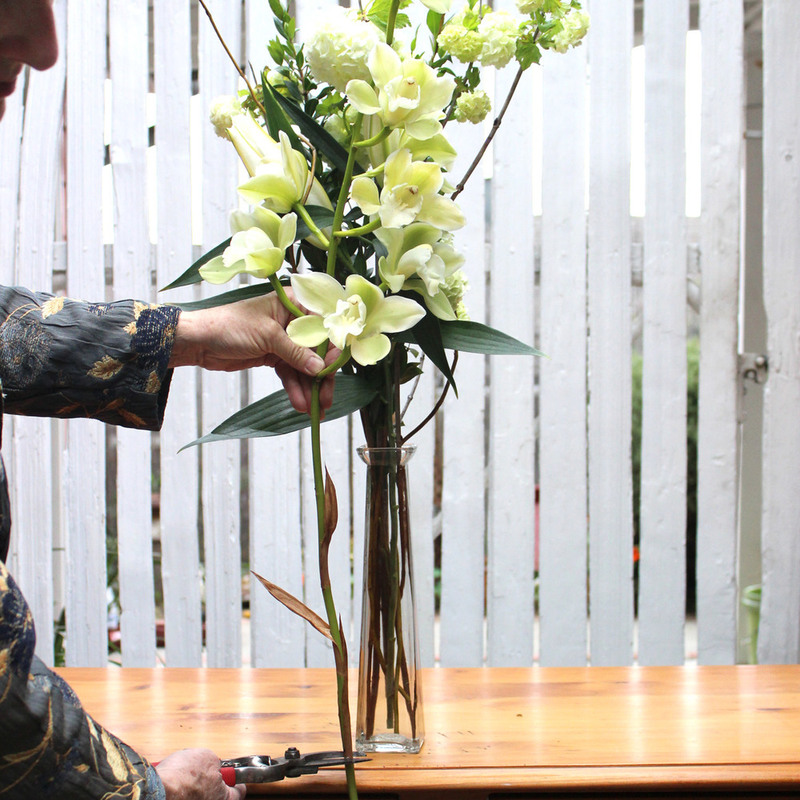 When they do start to open, make sure to remove the pollen sacs or stamens with your finger and thumb (or a plastic fork) as the pollen will stain any fabric, and even the lily itself. If pollen gets on the lily, take a pipe cleaner or small paint brush and gently brush it off. Now that we've completed our talk on pollen and pipe cleaners, let's get to work. Lovely ladies in all of their finery, the cymbidiums. These are the flowers for the arrangement. Fill vase with water up to a couple of inches below top. Measure the myrtle that will be below the water. Strip leaves below water line. Place myrtle in vase. Measure lily about 21 inches. Measure viburnum about 28.5 inches. 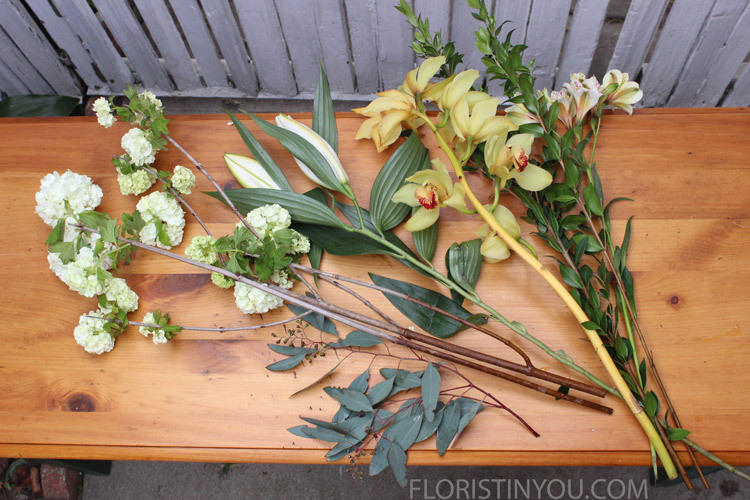 Make a bouquet adding lily and viburnum. Tie to other stalks for support. 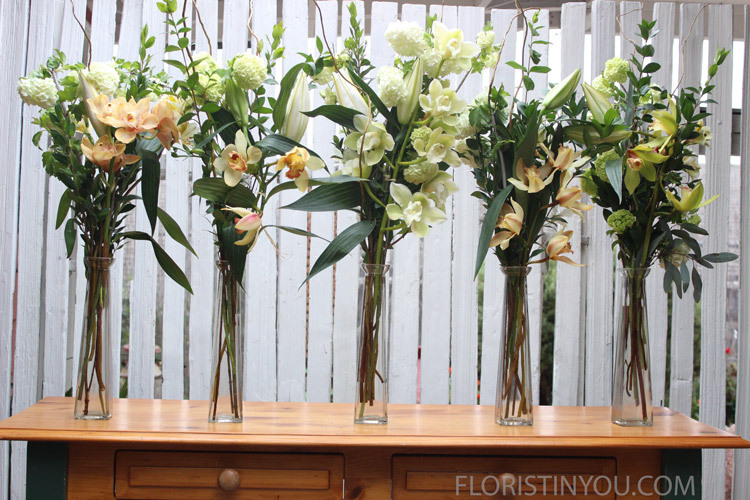 Add alstroemeria cut about 19 inches high to back left. Add white dendrobium orchid to back right. All the lovely ladies each resplendent on their own.